It’s a good thing he did. Rather than fighting for something or someone that helps people suffering from this economic crisis, President Obama strongly recommended and fought for Larry Summers to be Chairman of the Federal Reserve, a guy who lost a billion dollars as President of Harvard betting on interest rates. Yeah, let that sink in for awhile. It’s really not OK. This is why making excuses for everything the President does, as too many Democrats do without thinking of the damage, is dangerous, immoral, and unprincipled. Now it looks like the front runner to replace Ben Bernanke as Chairman of the Federal Reserve is going to be Vice Chairwoman of the Board of Governors of the Federal Reserve System and once President and Chief Executive Officer of the Federal Reserve Bank of San Francisco, Janet Yellin. Unlike Larry Summers, she at least saw the crisis coming as early as 2005. Yes they do. I have heard a statement that bugs me a lot lately and that statement is that this was the go to analysis for the Republicans as if Democrats have never referred to it in any way. I’m here to say that is complete BS and we know this now. The Sequester created by the WH and passed in a bipartisan way, was based on Reinhart and Rogoff’s BS analysis about scary scary long term debt to GDP ratios like their offer to cut Social Security. So let’s stop pretending this is only coming from Republicans, especially with the Obama administration using deficit lies and errors to come after Social Security. Reinhart and Rogoff’s complete methodology was BS and neither of them understand the nuanced difference between countries with a sovereign currency; fixed exchange rates and floating exchange rates; gold standard countries and those with a fiat currency and how that relates to reserve banking at the Fed and our private current account and trade balance within. So therefore it skews the mean and amounts to garbage methodology even if done correctly. There’s a solid account tying the Obama administration directly to the work of Reinhart and Rogoff. You will learn more about this below the fold. 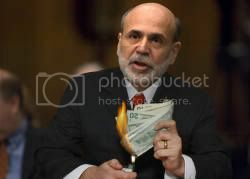 WASHINGTON-The U.S. economy ceased to function this week after unexpected existential remarks by Federal Reserve chairman Ben Bernanke shocked Americans into realizing that money is, in fact, just a meaningless and intangible social construct.